There should be a proviso in marriage vows saying something like, "for richer or for poorer, in sickness and in health, unless we are trying to do a project together in which case all hell will break loose and these vows are null and void, till death do us part." Preston and I cannot do a project together without a fight. We just can't. And we adore each other. Seriously, disgustingly in love. But we cannot. We got married way back in 2001, and DIY shows were new and all the rage, especially our personal favorite, Trading Spaces. We were addicted. It aired on Saturday mornings and like a million times during the week, so we watched it and watched it. We bought our first house together that year and were determined to make it unique by copying all the projects we saw on Trading Spaces. And we were smitten and Preston got a saw or something, so we had all we needed. We did so much in that house. We laid hardwood, created wall art, (which was not art by anyone's standards) painted every room in the house twice, redid cabinets, applied fake, peel off stick down "tile," glazed bathroom countertops and replaced light fixtures. We even replaced plumbing fixtures, which really turned into a brawl when Preston and his brother ended up CUTTING INTO A WALL to get to some pipe or something, turned the water off for over 24 hours, and spent the better part of a day (and night) playing with soldering stuff. I felt it served them right when they snuck into our neighbor's backyard in the middle of the night to wash their hands and these two huge, burly men had the crap scared out of them by a flock of birds. That almost made it worth it. We fought every single time we did a project. Every. Single. Time. You see, Preston is from the "perfectionist" camp, and I am way on the other side of the pond at the "that's good enough" camp. These camps do not play well together. Preston likes to think things through, research a topic, pick the best tools, plot out lines, make sure everything is square, read reviews, do lots of (I feel unnecessary) math before he begins a project. I hate this. In fact, I feel no planning is needed. Just get started, already. We can cut more/mix more/buy more/build more/redo if we need to. Just start! We moved into our next house in 2006, which happened to be built around 1900. It was on three acres and was like the Promised Land for us Project People. But I was deathly pregnant and couldn't do much, so Preston got to do projects as he liked. Only it annoyed the heck out of me when he would do a project, even one I had asked him to do, because it meant he wasn't at my beck and call (which at this point meant I needed him to hold the throw up bowl) or later on, wasn't available to bounce a screaming baby while I tried to refind my sanity. Because projects take him forever. Because of the perfectionist thing. But we did tons to that house, too - treehouse, knocking out walls, moving refrigerators, adding electrical outlets, building new walls, floors, roof, on and on and on - and all ourselves along with the help of friends and family, who frankly I'm surprised don't screen our calls. One of the very first projects we did here was build a treehouse. The girls went over to my parents' for the day, and I naively thought they would have treehouse when they returned. And it all started with just a post. No. We made lists. And did math. And dug holes. And cut boards. And screwed in lag bolts. And did more math. And when the day was over, a post was up. Have fun on your new post, kids. Preston says I have ridiculous expectations. I say he does way too much math. But we have learned how to work together. We don't fight. We (I) just huff and roll my eyes and when he accuses me of being impatient I can say, "I haven't said a word!" It works. This whole DIY culture has gotten way out of control what with entire TV networks dedicated to projects you can do for less than $1! Turn that broken down wheelbarrow into a pool in one weekend! Buy that mold ravaged double wide for $100 because we will show you how to flip it in just one week and make $2.2 million on your investment! Sew your own wedding dress from pillowcases in under three hours! 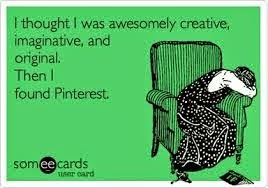 And don't even get me started on Pinterest. Delete it off your phone. Erase your account. You cannot hot glue pine cones together to recreate a ten foot Douglas Fir. 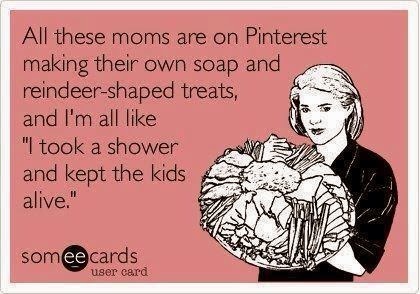 Some mothers may be able to transform their living rooms into Queen Elsa's castle using only tinfoil, but you aren't her. Do not pin things telling you how to turn cardboard into a dining room table using Elmer's glue and glitter. (for that matter, don't pin anything using glitter) You will not have flat abs in two weeks by doing this easy 3 minute workout once a week. You will not successfully organize your entire life in 72 easy steps using cereal boxes and washi tape. Your kid's childhood will not be made more magical by making hula hoops into necklaces. Your child will not eat the lunch you pack even if everything in it is cut into shapes of Walt Disney himself, so for the love, stop pinning! 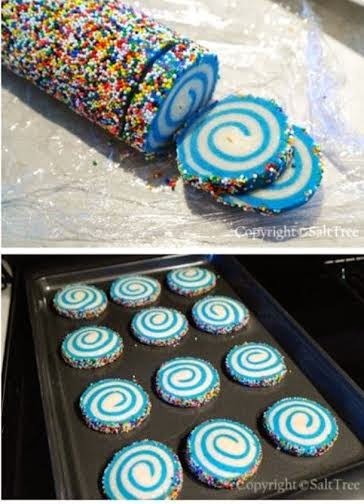 I honestly have only tried one thing off Pinterest, and although I showed it to you before, I think it is an excellent cautionary tale that deserves another look. 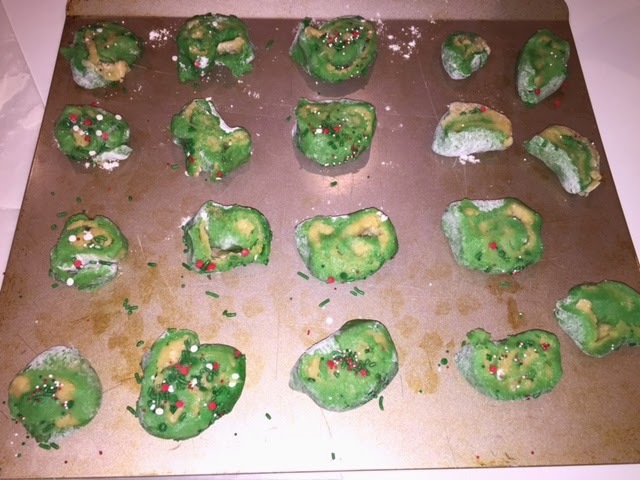 I don't know if this is clear by the pictures, but the cookies I made don't look like the Pinterest ones. But I'm sure Preston and I will continue to do projects. 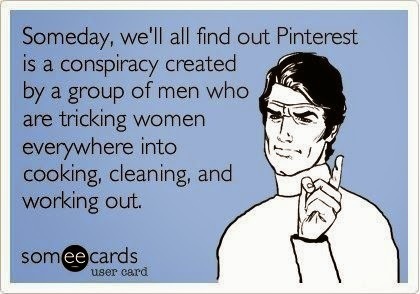 (he bookmarks things on Houzz, which is Pinterest for men) And I will keep pinning on Pinterest. It's a sickness. It has something to do with our inability to be still for long, I'm sure. If you ever hear we have split up, just know no one cheated. No one had a midlife crisis or went off the rails. We just tried to do a project. I'll tell that story another day.